Has Anyone Asked For AI-Heros In Arcade? Would it be possible or is it a lot of work to program AIs to play as heros? In the original Battlefront 1, heros only made an appearance as AI controlled allies in certain game modes. So yes it's fully possible to do so in this game considering the improvements that we are at currently. The hero AI in the original BF2 just used regular attacks. I would prefer some abilities to be used; however, if we got hero AI like the original games it would still be awesome. Please mention this in the Arcade Community Transmission, Thank you. And we eagerly await info regarding it from the devs. Have the devs responded to the request recently on any social media sites? I did unfortunately no answer. Even if they don't add AI hero's, the AI in general need some serious work. They are worthless, all they do is walk and shoot. If you noticed in changing the difficulty, they don't actually act different, they just do more damage. Typical lazy game development. We need to be able to play Star Wars with and against the iconic heroes that we grew up with. The trailer set it up as if you would be able to fight against Darth Maul ,or Yoda, or any of the others! But it turns out (even a year later) that you HAVE to be online to get those kind of perks. Please make the playing field even by offering an offline Heroes VS Villains Mode like the old battlefront 2 with at least 15 characters on each side (If we get that many by the end of the game.) Offline is way better in battlefront 2 than it was in the first game you produced( other than the fact we still don’t have any large scale game modes). We need this and so do you. They said something about this before, although I did not take a screenshot (It was a couple of months back, though so things could have changed since then.) They had trouble with certain Hero AI using abilities at the wrong times, I.E. Boba using the jetpack to cross a gap in order to reach an objective, but the gap was too large and he always ran out of fuel. Or with Rey or Han using their dash ability, they would charge off the edge of some maps when another AI would dodge out of the way or they would have targeting issues, etc. I'm sure it could be implemented with more time focused on it, but until they deem it enough of a priority to have a dedicated group of developers sit around and try to work out the problems it probably won't happen, at least without changing abilities or implementing severe restrictions on those abilities to the point where it could hamper or affect the feel or immersion of the game. Ultimately it comes down to development priority, and as much fun as it would be to see it added into Arcade, there are areas of the game which need more focus at the current time. Many who desire hero AI (including myself) would be fine if the AI didn't use those abilities. Personally, I think the only one of the abilities you listed that would affect immersion if it was absent is Boba's jet pack. When they said that they were having trouble, they also said they were working on it. Dennis has said they are still working on the large mode fro Arcade; hopefully, this has hero AI. I can't stand being taken out by elite players hero ai would greatly help for enjoying the game offline. I support the idea of epics in Arcade. But this is an older thread and hence will be closed soon. Playing against elites can be frustrating. Hero AI would help me enjoy this game better offline because I would love to be able to split screen something like HvV or Hero Shodown for years after the servers shut down. What do you mean by epics? There were some people asking for it in the reddit Arcade focused feedback. Dennis said they aren't doing a direct port of GA but are working on a large scale mode. Some (including myself) think it could be Conquest. Dome think it is large scale TDM. Either one would be better with hero AI. I haven't yet, but it's something I think they should have included with the game. However, I'd be a bit worried that introducing AI heroes to the game would create a host of new bugs. If the hero AI introduced some smaller bugs, personally, I would be patient with them while I enjoyed the hero AI. If the bugs rendered Arcade unplayable (like Jabba's Palace is now) that would be a problem. Yes, thought of it yesterday. And it would be nice since there aren't any coop arcade or split-screen arcade. Yes. I don't care if they aren't as good as having players controlling them. It would still be awesome to have. The hero AI from the 2005 game would be just fine. It would be cool to have to ability to adjust the health of the hero AI if we get it. Somebody knows if they're still working on it ? This is the very question I want to see get answered. An update on hero AI from the devs would be awesome. What are your thoughts on how they could implement hero AI? I asked again about hero ai for arcade but nothing sadly. Well Ben did mention they were making positive progress so I assume that means the A.I. aspect of it as well, I hope. What was Ben referring to when he said positive progress? Now that Heroes/ villains is mostly dominated by pack hunting trolls, matches aren't balanced or fun anymore. I would actually enjoy a nice single player experience with decent AI bots. But honestly, I'm getting ready to retire Battlefront 2 and I'm getting excited about the new single player game, Fallen Order. 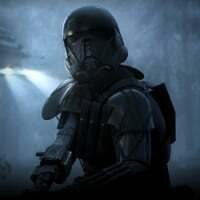 I personally will not retire SWBF 2 and would love to have a split screen co-op experience with hero AI for years to come. If iD could do it for Quake 3 back in 1999 then Dice can find a way to do it today. It would just take a bit of effort. Once the game loses it's support arcade is all that's left. They NEED to give it some work. You are right. Lets hope the devs will do this. I just love the heroes banter this with ai heroes would be fantastic. They don't have to be perfect. This would be fun to practice your heroes against other heroes and if nobody has asked for this yet, I'm asking for it now. Would it be possible or is it a lot of work to program AIs to play as heros? I would love this idea! But I do think it'd need to be era specific. As an example.. If you're on Yavin IV, controlling Vader or the Emperor, and facing Rebels. You wouldn't wanna be going up against someone like Finn or Rey. Y'know, just make it era specific. So, it keeps the authenticity correct, along with the immersion. But yes, I like this idea VERY much! Would be awesome to actually encounter a hero or villain and duel with them, while the troopers are off elsewhere, fighting. I think the best way to deal with AI hero selection would be to have a screen where you can select which heroes the AI can select from. It would be also be cool if we could save our options for future use.